I had a friend who loves the pink sands of Harbor Bay Island in the Bahamas. 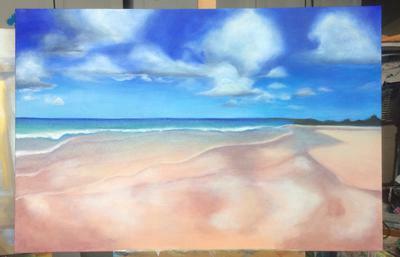 She asked if I would paint a beach with some clouds and proffered a picture. I had never painted clouds before. I found Mark's water tutorials very helpful and the cloud tutorial as well thanks for the tips they were SUPER HELPFUL. I was able to sell my finished work .